A reminder that the voting deadline is April 15. Ballots and the official voting tally sheets are in the Project Kit on the website. Every vote by every student in a registered Hackmatack group will be counted to determine who will receive the 2019 Hackmatack awards! Please send a brief letter of interest to hackmatack@hackmatack.ca including your name and contact information and what interests you about being a member of the Hackmatack board. ** We welcome interested parties to self-identify in any way they feel comfortable as well as including any insight into pertinent work / volunteer experience. It is with heavy hearts that we share the news that Hackmatack Board member Sharon Palermo passed away on March 5 after a brief illness. She was a dedicated educator and children’s author who was passionate about books and reading. Sharon proposed the idea of a “tree award” for the Atlantic region, putting in motion what would become the Hackmatack Children’s Choice Book Award. She devoted a tremendous amount of time and energy to the Hackmatack program. Her board work included a seat on the promotions committee, and she generously hosted meetings in her home. Through her tireless support she shared her love of reading with children across Nova Scotia and throughout Atlantic Canada. We continue to be indebted to Sharon and her commitment to Hackmatack. It was a pleasure to work with her. She will be sadly missed. Sharon’s obituary is available online at Arbor Memorial. The family has requested that in lieu of flowers, donations may be made to the Hackmatack Children’s Choice Book Award and Society. 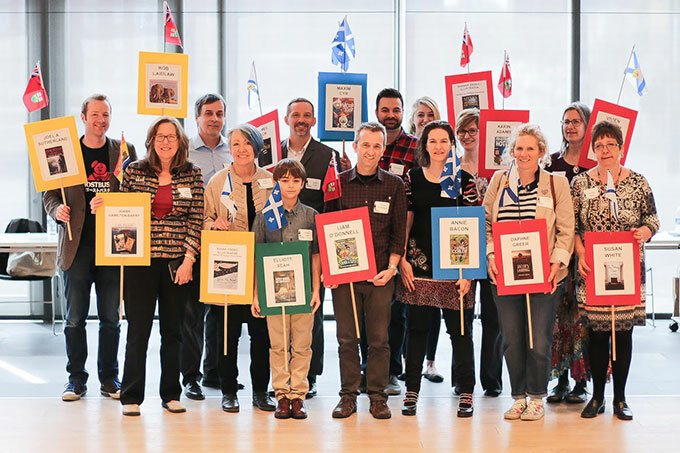 We kicked off our 20th anniversary year with the Hackmatack “20 for 20” campaign, to help send nominated authors to schools and libraries in the Atlantic Provinces. Thank you to everyone who participated! Read all about it here. Register now for Hackmatack 2018–19. Download the registration brochure here. Win a Set of Hackmatack Nominated Books! All registered groups will be entered in a draw to win a set of next year’s Hackmatack nominated books, donated by TD Canada Trust. One school or library from each Atlantic province will be drawn at the award ceremony. The readers have spoken! Click here to find out who were the winners of the 2018 Hackmatack Children’s Choice Book Award. If you missed the 2018 Hackmatack Children’s Choice Book Award Ceremony, it’s available for viewing here. Enjoy!